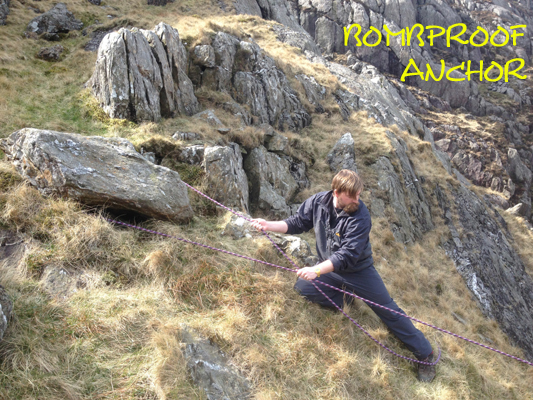 Moving on with steep ground skills, this week’s post looks at emergency rope-work in descent. As with previous posts, the intention is to keep things safe and simple, with the emphasis on avoiding over complicated rope-work that can often be unnecessary and time consuming (remembering that the planned use of the rope is beyond the scope of the mountain leader award; however, we still need to have the rope-work skills in place and to put in enough practice to keep our skills slick). In certain situations it can be a safer option to use a rope to descend to safe ground, before re-planning a more suitable route, rather than continuing and over complicating your ascent. Care needs to be taken, as emergency rope work in descent can sometimes cause more problems than in solves. 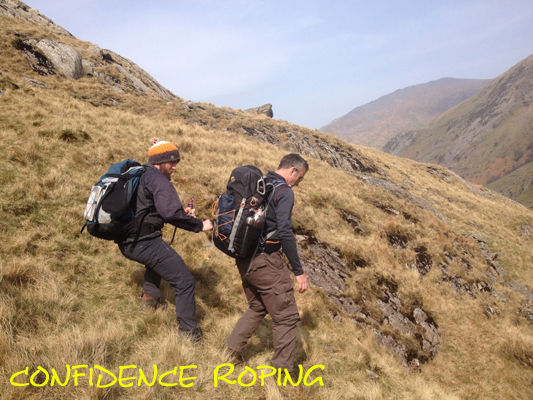 Difficult, steep, overhanging and long descents using a rope should be avoided. It is always safer to look for a better and more straightforward alternative. A good tip is to work on the fundamental skills of route planning and selection, as these skills will more often than not prevent an emergency descent requiring rope-work. 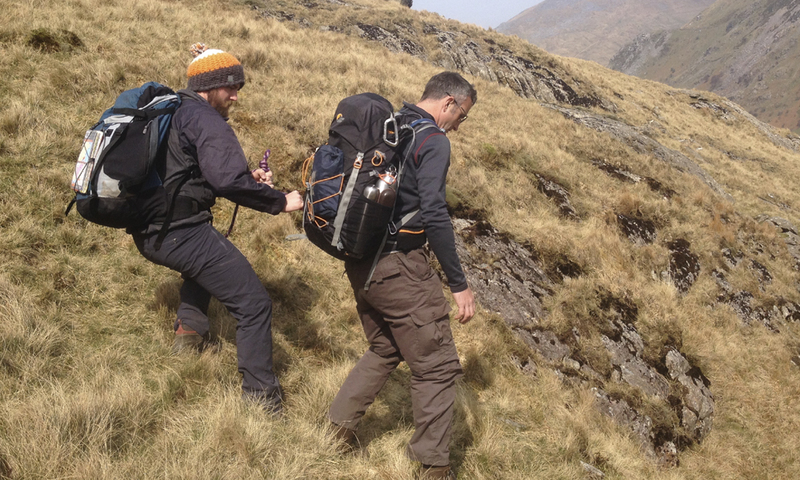 Recently there have been some changes to the mountain leader award guidelines for steep ground. A direct belay is far more secure (and comfortable for the belayer) than a waist belay. A tight waist loop for the scrambler (an overhand knot on the bight is easy to tie and adjust). 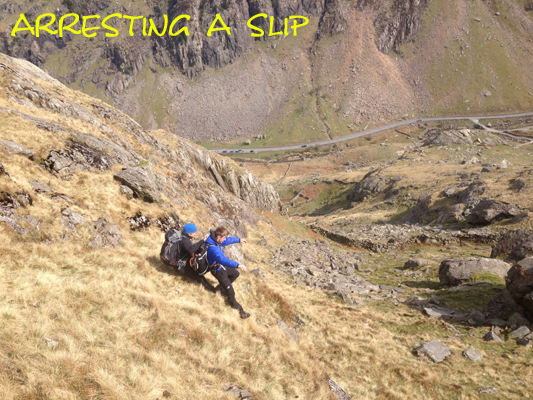 If it is slippery or there is a lack of holds, a second loop in the rope as a hand hold can work well. Find a good, safe area for group members to wait for the rest of the party. As the leader, always remember that if you decide to use the rope to safeguard your group members in descent, you also have to get yourself down safely! You may be able to safely scramble down; sometimes, however, the rope could be your only or best alternative. There are a number of options open to you; I’m going to look at three methods that use a doubled rope, as you will need to retrieve the rope after use. To descend an easy step, monkey down the rope hand over hand. On something steeper or slippery, the classic abseil is an option. Disadvantages it’s uncomfortable; it’s not that secure on steep or overhanging rock. 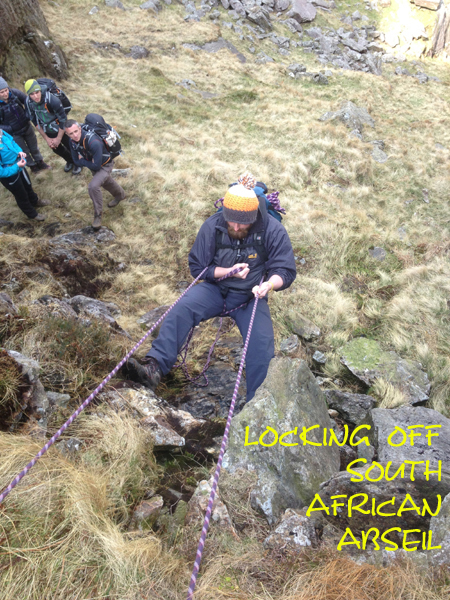 A better option is the South African abseil: it’s more effective and secure than the classic, and more comfortable (although not much!). 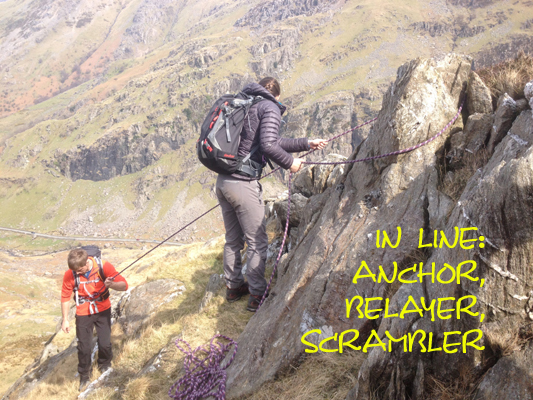 As mentioned in previous posts, a direct belay leaves little or no margin for error. 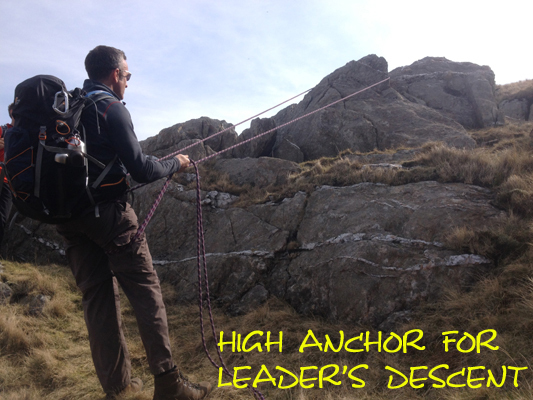 Excellent judgement is needed in your anchor selection and position for belaying. Poor anchor selection can result in a potential serious accident, as you are totally reliant on the anchor for the security of the scrambler. Although confidence roping is not that often called for, there are occasions where a party member becomes intimidated when on a steep slope. If anything, it’s usually when descending steep grassy slopes. If you have to resort to utilising confidence roping, be careful that in getting the rope out you don’t compound the situation. Having the rope stored in a convenient place, with easy quick access is the way forward (as discussed in previous posts). This allows you to attach the rope quickly and efficiently, and get on with things without causing further stress to a group member who’s not feeling too comfortable to start with. The rope needs to be attached to the party member securely (an overhand knot on the bight to form a loop works well, and is quick and easy to adjust). Slide the knot to the back. The rope out between you and party member needs to be short (you need to be close enough to reach waist loop). Paying spare rope into stuff sack (as in throw lines) and storing at the top of your sack is efficient, making it easy to access more rope if required. Give lots of encouragement – talking is good! A short step that can’t be avoided can be efficiently managed by using a direct belay; this often works well. Whenever possible, the leader needs to keep uphill and parallel to the party member; if this isn’t possible, stay close, with a little rope out. Wearing gloves is always beneficial when using the rope . We use the term emergency rope-work because it’s your last resort. It’s far better to hone your route planning/finding skills.